Beautiful handmade four tiers Diaper Cake! It can be used as a shower centerpiece or just to give as a gift. This cake made of 60-70 diapers Pampers Swaddlers size 1-2 (8-15 lbs. 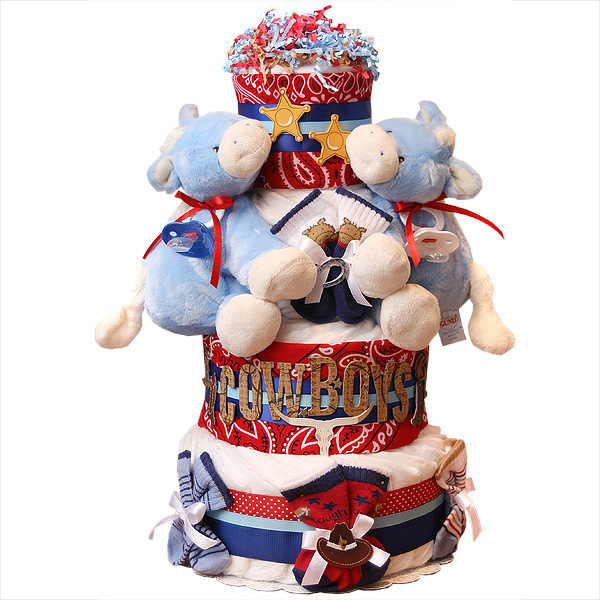 ); four pairs of baby socks with cowboy theme; Two red bandannas; Two soft baby toy horses by GUNDbaby; Two pacifiers; Scrapbook embellishments. The diapers are held together by elegant ribbons (no glue on diapers). Decorated with pins, ribbons and bows.